There is nothing unusual about Whitney Stohr being out and about in Selah, WA, a city of 7,500 people just a few miles outside of Yakima. Whitney is executive director of the Selah Downtown Association, whose goal is to stimulate economic activity in the city’s central area. To do her job, she is always on the go in Selah. One day, recently, Whitney had company as she went here and there in Selah. Not human company, but one made out of cardboard — a figure called Cut-Out Clara. Cut-out Clara bears the likeness of Clara Barton, the Civil War battlefield nurse who went on to found the American Red Cross in 1881. March is Red Cross Month, and Cut-Out Clara is the symbol — the mascot if you will — as the Red Cross celebrates 138 years of providing disaster assistance and much, much more to the American people. Malachi was diagnosed with serious heart issues before he was even born. When Whitney went into labor, she was rushed by plane in the middle of the night from Yakima to the University of Washington Medical Center in Seattle. Once Malachi was born, mother and child were taken by ambulance to Seattle Children’s Hospital. There, Malachi stayed for those first critical months of his life. “Malachi went directly into surgery that first day,” Whitney says. That was to correct a condition called spina bifida, where the backbone is not completely formed. Malachi was back in surgery on his second day, this time to drain fluid from around his brain. He later went through yet another operation — open heart surgery to correct those dangerous heart issues. Malachi is now 14 months old and back home, the hospital experiences safely behind him. And Whitney is quick to credit the Red Cross for the blood given to Malachi when he needed it. “We’re grateful to the Red Cross for supplying the blood, and grateful to the donors who gave the blood,” she says. Whitney first heard about Cut-Out Clara on the Facebook page of the Northwest Region of the American Red Cross. 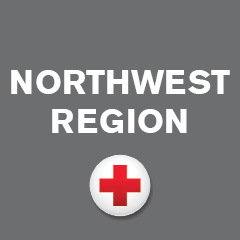 Selah is in the Central and Southeast Washington Chapter of the Red Cross, one of the seven chapters that make up the Northwest Region. The chapter is headquartered in Kennewick WA, but there is a field office in Yakima. Whitney asked the Red Cross when Clara might be coming to Selah. “I got a call asking if I would bring Clara to the Yakima Valley,” she says. The Red Cross e-mailed her a file. Whitney printed it out, thereby bringing Cut-Out Clara right to her backyard.. Her day out with Clara began at the Selah City Hall. It was an obvious first stop since the city is celebrating its 100th birthday this year. Next she introduced Clara to the city’s first responders — the police and firefighters who work side-by-side with the Red Cross at disaster scenes. Finally Whitney went to the Red Cross office in Yakima, where she donated blood. She says she donated blood frequently when she was in college, but as a working mother hasn’t always been able to find the time to do so more recently. This time she did donate blood, with Cut-Out Clara at her side. It won’t be her last blood donation, either. For one thing, she knows there must be other children whose lives could depend on there being blood on hand when it is needed. For another, Whitney learned there is nothing complicated or time-consuming about donating blood to the Red Cross. “All you have to do is make an appointment and go down to wherever the Red Cross is collecting blood, and do it.” she says. If you need a reminder to donate blood, keep Red Cross Month in mind. And think about Cut-Out Clara, and the lives — like that of young Malachi — that your donation might save.